I’m very happy to announce my first solo show, to be held at the Fort Mason Foundation Lobby, Building “A,” next door to the SFMOMA Artist Gallery. I’ll have prints you’ve probably never seen even if you’ve attended past shows, the lobby is open daily, and admission is free. A reception will be held on Wednesday, July 5, 5:30–7:00 p.m. Meet me and enjoy light refreshments while chatting with other art lovers, and taking in the night photos. 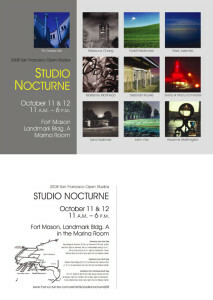 The SFMOMA Artist Gallery will also be holding a reception at that time, so feel free to see both shows. Admission is free, and the show runs through August 18. Will you be attending Photo San Francisco at Fort Mason Center July 21–23? Take a short walk to Building “A” and take in my After Dark exhibit. I’ll be there Saturday and Sunday, 3–7 p.m. See my ad in the Photo San Francisco catalog. Laguna St. and Marina Blvd. Drumm St. and Sacramento St. I plan to be at the reception for the artists on Wednesday, February 9, at 5:30–7:30 p.m. at Fort Mason Center, Landmark Building “A.” So stop by, check out the art, and say hello!